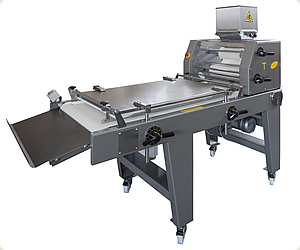 The dough moulder OBLIK 1 is a universal and robust machine, designed for longitudinal moulding of wheaten and mixed rye-wheaten doughs. It is manufactured in accordance with the valid CE standards. All the machine parts which come into contact with dough are made of materials permitted for food industry. The roundly shaped dough pieces enter into the centering hopper. Dough is rolled up into the desired thickness between two pairs of rollers. Under the chain drag made of stainless steel the dough foil is rolled up into a loaf. The final shape of a loaf is made on its way between the conveyor belt and the moulding board. The height of the moulding board can be precisely and accurately adjusted by the two handles. The side guides are adjustable.